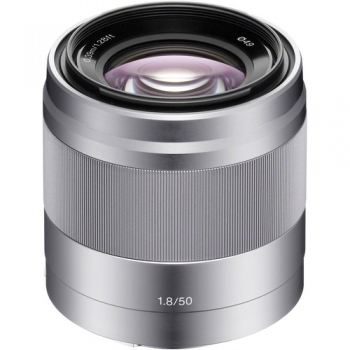 Sony's 50mm f/1.8 Telephoto Lens is an E-mount compatible lens, ideal for use with Sony's line of NEX-5 and NEX-7 cameras. Made from aluminum alloy, the lens is both tough and light, weighing in at around 7.25 ounces - guaranteed not to hold you back. More than being a travel-friendly lens however, this 50mm is a versatile shooter with an aperture range of f/1.8-22, a 0.16x magnification, and a minimum focusing distance of 15.3". The front filter diameter allows for the addition of 49mm filters. Sony also gave the lens their proprietary built-in Optical SteadyShot image stabilization for both blur-free stills and videos. When shooting at high speeds, the linear motor and the stepping motor work quietly to achieve focus and aperture. Direct Manual Focus on the other hand allows you to go directly from autofocus to manual focus for convenient, on-the-fly shooting.